I think our favorite list of browsers have just increased! Right now my top 5 are of no secret to anyone and I always post about them. TenFourFox, AuroraFox, WebKit Leopard, SeaMonkey and Camino/Omniweb are basically the guardians of browsers for the PowerPC, but Roccat Browser surprised me a lot. It’s very fast to browse the internet and the good news is now we are able to watch videos on Youtube without that annoying pause and delay! Some features like FusedBar and Facebook/Twitter integration is also a plus. Ad-Remover is a really nice touch and I have to mention that I like the clean layout, and the visual tabs are able to be positioned anywhere you prefer. 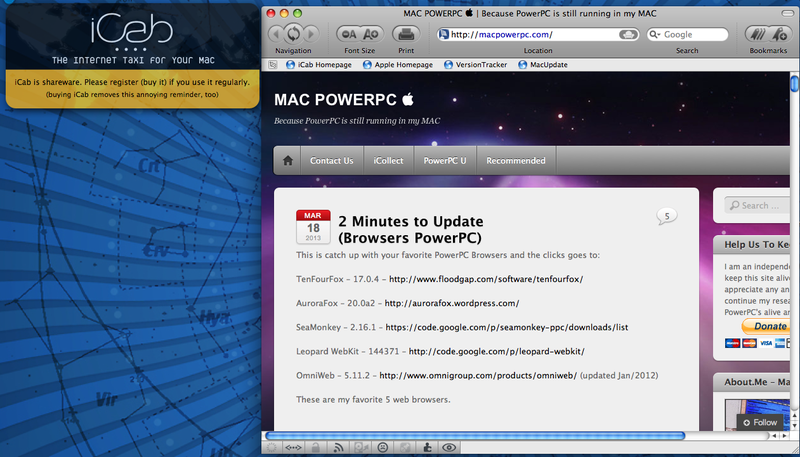 Let’s show some love and spread the word for all the PowerPC community and make sure that the people behind this project know that there are PowerPC users using this Browser so they will still (I hope) create updates for our system! Roccat Browser 3.0 (Free) – http://www.runecats.com/roccat.html PowerPC – Leopard/10.5. You guys can leave some comments for the developers here: http://www.macupdate.com/app/mac/37403/roccat-browser make sure to mention you are running their software on a PowerPC. P.S. : For the tittles I’m taking reference from some music or records.